Debacle Records is one of the finest sources in the Pacific Northwest for the cryptic and obscure sounds that hover on the fringes of larger scenes. Impervious to trend and richly experimental, Debacle mines the outer reaches of industrial, ambient, and noise, while giving home to weirdo pop creations like Biosexual. The expansion has even birthed a bi-monthly dance night, curated by a collective known as MOTOR. The MOTOR collective includes Debacles Sam Melancon, DJ Slow, Patternmaster, and Timm Mason and Jayson Kochan of TJ Max, consider them the residents of the dance night. The collective is developing into a label, to give home to the core's exploration into psychedelic dance vibrations. It's an exploration that now includes HOM, a trance-y project by Ashley P. Svn. Dark and hypnotic, the HOM 12″ carves a sensual niche of propulsive deep house on b-side, “Somn”. The track glows with metallic ambient passages that sooth the membranes into tranquility, allowing HOM to guide the movement into energetic terrain and give a tiring dance floor a second wind. 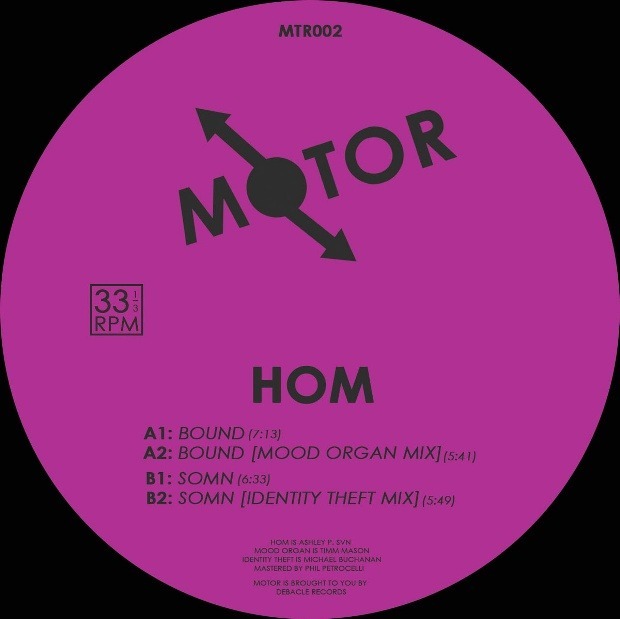 HOM's “Bound” b/w “Somn” 12″ is out January 28 on MOTOR. Preorder the 12″ on Bandcamp.